Machine Shop Hobbyist is for do-it-yourselfers and hobbyists who want to set up or expand a small machine shop in their garage, basement, shed or perhaps in a rented space. With their own shop, hobbyists can build models and undertake other building and maintenance projects that involve using different metals. Working in metal requires skills, knowledge, and equipment that are unlike other hobbies. 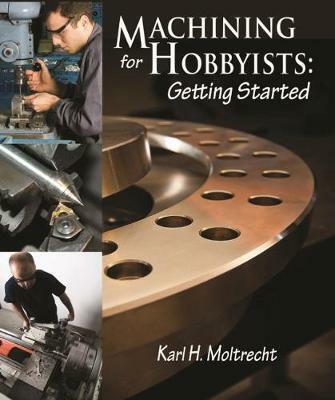 Through easy-to-follow explanations, as well as detailed illustrations and color photography, Machine Shop Hobbyist guides hobbyists in selecting the proper tools for working with metal, including tips for buying and using bench-top lathes, mills and drill presses. The book also covers the various cutting components used on these tools. It provides suggestions for shop layout, including space requirements, lighting, ventilation, and safety. The book guides the reader through the use of specialty tools used for measuring and handling small metal parts. K. H. Moltrecht was born 2/7/1920 in Berlin, Germany. He came to the USA in 1925 with his family and served in the US Navy in WWII. He was a long time professor at Ohio State University in the Industrial and Systems Engineering department. He became associate professor emeritus of industrial and systems engineering at Ohio State University, Columbus, OH. He died at the age of 63.